Paint and Sip events continue to be one of the most popular forms of casual, hands-on entertainment for guests of all ages. While relaxing with friends or work associates you’re able to create a work of art that you never thought possible . . . all while forgetting any worries or concerns of the day! Guests are guided through the process of painting on canvas with the help of a local artist . . . while they’re eating and drinking! Painting Parties, LLC is a mobile Paint and Sip company that brings “Art for Entertainment” to customers with all levels of artistic experience throughout Delaware and parts of PA and MD. Why Team build with a Paint and Sip event? Collaborative activities involving immediate work groups or interdepartmental employees help to improve morale, communications and ultimately productivity. When co-workers are better able to understand each other’s strengths and weaknesses, socializing improves and teamwork becomes easier and more rewarding. The first option is to allow each guest to create their own work of art as they’re provided the steps necessary to complete a painting chosen to represent their team activity or future goal. Just sitting next to someone and sharing a new creative task can bond members of a staff as they gain a sense of accomplishment together. Everyone leaves with a painting they can be proud to display! Another option is to break a team into groups and break a painting into stages, and have each group complete one painting on one canvas with 6 or 8 “artists”. Each rotating member working together on a collaborative goal of completing the “best” or “most creative” or “best use of color” or just “best effort” of all the smaller groups competing against one another. You could also rotate a canvas around an entire team all contributing to the painting as the instructor demonstrates each step. There are of course many ways to structure such an event . . . the main purpose being achieved in all scenarios “network, socialize and bond in a way that’s impossible by other means”. The online gallery offers many painting choices, but if something unique is required a request can be made for a custom painting for a small extra charge. As long as tables, chairs and a water source are provided Painting Parties provides the rest. How much experience is needed? What if I have zero talent? “I can’t draw a straight line” we also see customers shocked at the quality of their first painting. Everyone improves with practice, but first time painters are highly successful! It’s been said that happiness comes from learning and performance. These are not always available during the same activity . . . but painting alongside a friend, a mentor or a co-worker affords both. Painting Parties hosts events 7 days a week and can start as early as 12:00 p.m. or as late as 7:00 p.m. Events typically include 2 hours of instruction, but guests are never rushed and there’s always time for food, drink, socializing, and picture taking. The event can be hosted at your place of business, conference center or your favorite restaurant. You just show up and paint (and party)! What other types of events are offered? Party options include public events at local restaurants, private events, or fundraising for personal and public charities, hospitals, dog rescues and more. A day focused on art is a day not focused on problems of any kind. 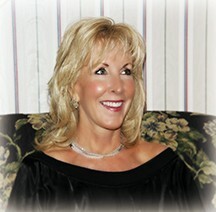 Events are staffed so that every guest receives one-on-one help with their painting if requested. Our goal is to have everyone go home happy and satisfied . . . even if it’s their first time painting. It’s a stress reducer, brings people together for a fun activity and can raise funds for worthy cause! Being able to introduce guests to art and watch them discover what they can accomplish in two hours is gratifying and continues to motivate the team. With supplies that can accommodate 150 guests, Painting Parties is in a unique position for an independent mobile art studio to make a significant contribution to fundraising goals, accommodate large restaurant ‘dinner and painting’ events (join us at Caffe Gelato in Newark!) and most any size company staff. Children as young as eight are welcome, so bring the kids if you want . . . and anyone older! Alcohol is just an option for adults 21 and over at some events, but it’s not an adult-only activity. Bring the spouse! If you have a team that could benefit by working more closely together or you just want to say thanks to your fellow co-workers, you may want to discover your inner artist and improve collaboration at the same time! 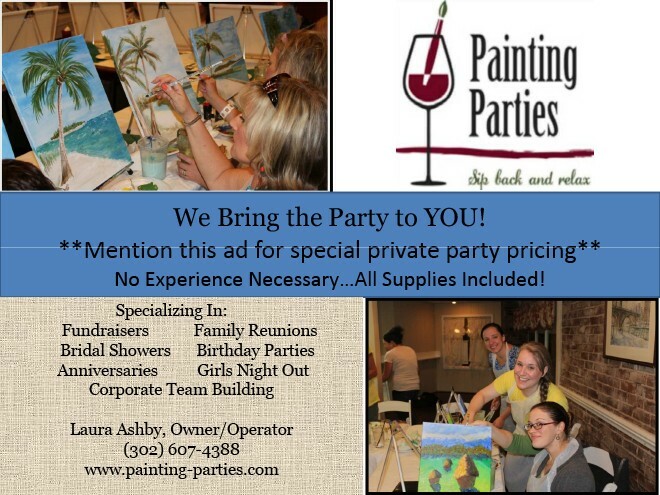 A Painting Parties, LLC event is the perfect fundraiser for all types of causes and for all ages! My son needed to raise money for his Eagle Scout Service Project. I immediately suggested this company after having attended a Painting Parties event months earlier. EVERYONE had a blast at both events! Participants ranged in age from 6 yrs to over 75 and fun was had by all! We didn’t realize we had such ‘hidden’ artistic talent! Artist Jarred Fisher lead the instruction’s basic mechanics but most importantly encouraged us to add our own creatively to our work of art. The owner and artist were very professional and helpful. My son and I highly recommend this company and have already hosted a second successful troop fundraiser.